1 Publications by "J. Chern"
One of the current challenges in tropical cyclone (TC)1 research is how to improve our understanding of TC interannual variability and the impact of climate change on TCs. Recent advances in global modeling, visualization, and supercomputing technologies at NASA show potential for such studies. In this study, we discuss recent scalability improvement to the Multiscale Modeling Framework (MMF) that makes it feasible to perform long-term TC- resolving simulations. The MMF consists of the finite-volume General Circulation model (fvGCM), supplemented by a copy of the Goddard Cumulus Ensemble model (GCE) at each of the fvGCM grid points, giving 13,104 copies of GCEs. The original fvGCM implementation has a 1D data decomposition. The revised MMF implementation retains the 1D decomposition for most of the code, but uses a 2D decomposition for the massive copies of GCEs which uses a second level of parallelism to execute it. 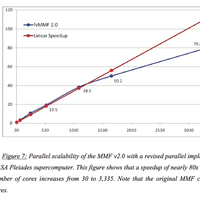 Since the vast majority of computation time in the MMF is spent computing the GCEs, this approach can achieve excellent speedup without incurring the cost of modifying the entire code. Intelligent process mapping allows differing numbers of processes to be assigned to each domain for load balancing. The revised parallel implementation shows very promising scalability, obtaining a nearly 80-fold speedup by increasing the number of cores from 30 to 3,335. Future work will be discussed in the concluding remarks. B. Shen, W. Tao, J. Chern, R. Atlas, and K. Palaniappan. Scalability improvements in the NASA Goddard Multiscale Modeling Framework for tropical cyclone climate studies. Proc. 10th Int. Conf. for High-Performance Computing in ASIA-Pacific Region, 2009.